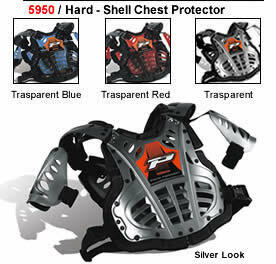 PROGRIP CHEST PROTECTOR - PG 5950 ADULT PRICE INR 6450 This hard-shell chest protector for OFF-ROAD use is the result of our in-house R&D department working with demanding Off-Road Professional riders. It's made of impact resistant polypropylene and provides a high level of comfort and protection. The front panel is connected to the rear shell with comfortable articulated joints. The placement of internal padding where the chest protector comes in contact with the body also add to the overall comfort of this design. The racing look and design of this winning chest protector are available in 3 colors i.e., Transparent Clear, Transparent Blue and Transparent Red.